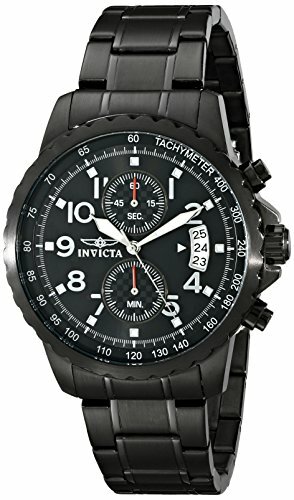 Smooth and sporty in an all black design with chronograph feature, this Specialty timepiece from the renowned Invicta will make a handsome addition to any gentleman's wardrobe. Easy to pair with any outfit and with a modest, 45 mm size, this watch is made for the man with elegant and stylish tastes. An inner tachymeter feature on the bezel creates a display that's perfect for the man on the go. This website is an authorized reseller of Invicta and each piece comes with the manufacturer warranty.